When Sony announced its second-generation A7 mirrorless camera, much of the excitement prior to release was due to the device's novel five-axis, in-body stabilization system that promised to steady shots with any lens -- new or old. Coupled with a 24.3-megapixel full-frame CMOS sensor, the same one found on the original model, the A7 II's newly minted SteadyShot built-in stabilizer automatically made this compact shooter our likely new favorite in the mirrorless camera category, and perhaps a respectable challenger to some DSLRs, too. On paper, at least, it's as solid a package as it gets -- which is, ultimately, the bare minimum you should expect when you spend $1,700. 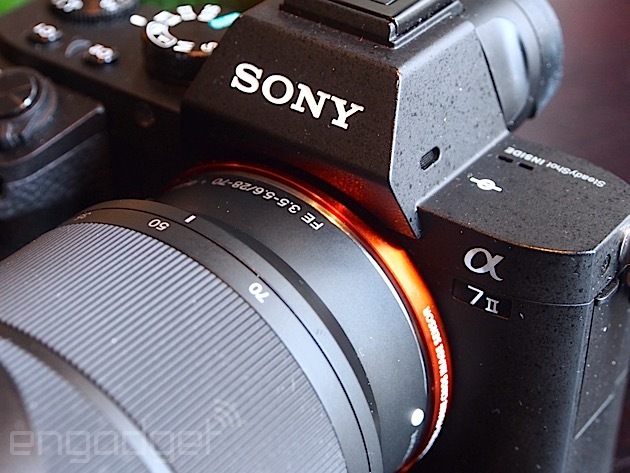 The good news is that Sony's A7 II does deliver on the high expectations. But it's not without limitations. For starters, the selection of full-frame E-mount lenses is narrow and, in some cases, quite expensive. Still, it's not like you only have one or two options to choose from. Plus, you can always attach non-Sony mount lenses via adapters, giving you an alternative that, in theory, should work fine with the in-camera stabilization. I've spent my time with the A7 II using it alongside a 28-70mm, f/3.5-5.6 E-Mount Optical SteadyShot lens, and it's been a beauty thus far. As expected, the A7 II produces high-quality shots, regardless of whether you're shooting in broad daylight or in the wee hours of the night. In large part, that's mostly due to its incredible full-frame sensor and BIONZ X image processor, which supports 14-bit RAW files and a maximum shutter speed of 1/8000. Having said that, the A7 did struggle slightly when shooting at higher ISO levels, particularly in JPEG mode (the camera goes up to ISO 25,600). Yes, I know, this is why you should always -- always -- shoot RAW, but that won't help anyone who's trying to grab an image quickly and straight out of the camera. (I was shooting RAW + JPEG.) Nevertheless, there weren't many scenarios where the A7 II underperformed; it can handle just about anything you throw it at it, so long as you keep in mind that in the end, it's still a mirrorless camera. Meanwhile, the new SteadyShot five-axis stabilization, which aims to reduce camera shake regardless of the lens, actually works. You can really see the system shine, for example, when you're in hand-held mode, zoomed all the way in on a subject; comparing results is simple, since you can easily turn the feature on or off. Sony says that this type of in-camera stabilization isn't brand-new technology, with Olympus having used it in the past, but the company says it had to tweak the system to make it work like a charm with its own full-frame sensor and line of E-Mount/A-Mount lenses. Furthermore, there's a new hybrid autofocus system inside the A7 II, which the company claims offers a 30 percent improvement over the first-generation model, thanks to its 117 phase-detection and 25 contrast-detection points. Next to the new compensation system, that makes it easier to shoot at a wider range of speeds. Still, I feel like the autofocus could be better, since it did struggle at times while trying to capture fixed subjects in macro mode. Inside, you'll also find WiFi and NFC support, in case you need to share files wirelessly. In terms of video, Sony's A7 II can only shoot a maximum of 1080p at up to 60 fps, and that will likely disappoint some people. Sure, 4K isn't the norm quite yet, but at least you would be future-proofed when that resolution does become the standard. So, unlike its sibling, the A7S, the A7 II isn't fully stacked and 4K-ready. Sony probably made the choice to leave that out in an effort to keep the cost down and, perhaps, to keep the A7S appealing to the niche crowd looking for the highest-resolution video. The video quality is great, don't get me wrong, but I just wish I could have the ability to shoot in 4K -- even if the times when I actually had a legitimate reason to use it were very few. Given that the built-in five-axis stabilization can be used for video, Sony notes that it was important to have it operate extremely quietly. It needed to be swift, efficient and silent. When turned on while shooting video, not once did I run into a situation where I heard the SteadyShot system being active. It does exactly what it's supposed to, and it does it silently. One of my favorite things about the A7 II is the way it feels in your hand. This piece of kit is rock-hard, exactly what you would expect from a body made up of pure metal (magnesium alloy, to be specific). It's strong, but it doesn't feel heavy. It's compact, but it doesn't feel small. Better yet, there's a 3-inch, 1.2 million-dot, articulating LCD on the back, allowing you to browse through pictures and videos with a pleasant swiftness. Design-wise, the A7 II is quite similar to the A7 Mark I, but that's not to say there aren't any changes. Most notably, the shutter button now sits atop the grip, so it's now more easily accessible. The rest of the button layout is virtually unchanged, though Sony did add a couple custom controls next to the main dials. The bad news is that it's not a touchscreen, a feature that's to be expected in just about every camera in this day and age -- especially one that sells for a premium. At any rate, in case you don't want to use that adjustable screen to frame your shots, the camera features a 2.4 million-dot electronic viewfinder, the same one found on its predecessor, the A7. All in all, Sony took everything it learned from the launch of the original A7 and made it better. Yes, the A7 II is heavier and, yes, it is missing attributes, like 4K video. However, those compromises (if you can call them that) mean the new camera starts at $1,700 for the body only, making it relatively accessible to prosumers. And make no mistake: It's worth every penny.